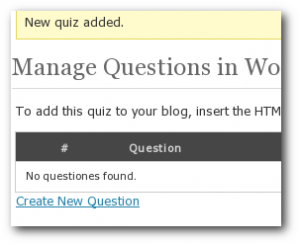 Quizzin WordPress Plugin lets you add quizzes to your blog. This plugin is designed to be as easy to use as possible. Quizzes, questions and answers can be added from the admin side. This will appear in your post if you add a small HTML comment in your post. Note 1: Quzzin is a beta plugin(as are most of the plugins released in the Plugin Week) – so watch out for bugs. And trust me, there will be quite a few. After creating the quiz, create a new post and add the HTML comment [QUIZZIN 1] in it. Here the ‘1’ should be the ID of the quiz to be inserted. This plugin is pretty straight forward – after enabling the plugin, go to the Manage Quiz page(Manage > Manage Quiz). All the existing quizzes will be show here. You also have the option of creating a new quiz – or editing an existing one. Click on the ‘Create new Quiz’ link to create a new quiz – you have to fill in three fields – the quiz name, the description and the Final Screen. The ‘Final screen’ field is very important – you can customize the result of the quiz using this. Basically, what you fill in here will be shown when a user completes the quiz. You can use several variables here. For example, if you put in the text ‘%%SCORE%%’, it will be replaced by the score the user got in the quiz. %%GRADE%% 1-10 value. 1 is 10% or less, 2 is 20% or less, and so on. %%DESCRIPTION%% The text entered in the description field. Once you have filled out this form, you will be taken to the next page where you can manage your questions. Click on the ‘Create new Question’ to add your questions and answers. You have to select one of the answers as the correct one. After you have added all the question, create a new post and add the HTML comment [QUIZZIN 1] – here the 1 should be the ID of the quiz to be inserted. That’s it – you should have a working quiz on your blog now. 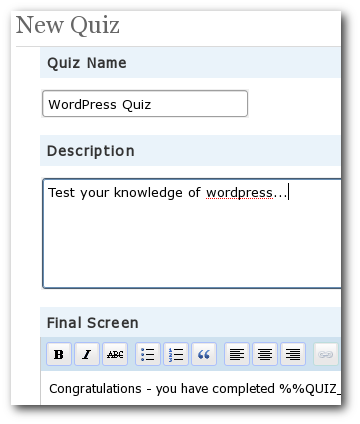 I have created a WordPress Quiz using the Quizzin plugin. Lets see how well you know wordpress. If you take the quiz, post your results in the comments field. Thanks to ‘The’ Anand for suggesting the idea of a Quiz plugin. Also, Mani Karthik provided a lot of encouragement to create the plugin. As a matter of fact, Quizzin is the first plugin in the plugin week series. When those two suggested the Quiz plugin, my lazy brain immediately saw the benefits – I get 3 plugins for the price of one. Once the quiz plugin is created, just remove the correct answer option, limit the question to just one and record the answers – and you have a Poll plugin. To create a survey plugin, just remove the correct answer option and record the user’s input. You also need to create a interface to show the results. Voila – you have a survey plugin. That’s right – the Pollin Plugin and Surveys plugin are based on the Quizzin Plugin. The eventr plugin was created for the Barcamp Kerala. Again, the credit for its suggestion goes to Anand. After that plugin was ready, I am sitting on four unreleased plugins(that is, two plugins and an idea for two more) – that’s when the thought of doing a plugin week hit me. The rest, as they say, is history. 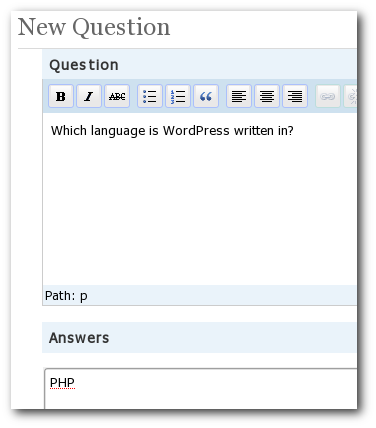 If you have any suggestions or notice any problems with the Quizzin WordPress plugin, post it in the Quizzin forum. That’s it! Plugin week is over. 6 days, 6 plugins. Now, I have to go catch up on some much needed sleep. Happy Blogging! I’m having a problem with the Quizzin plugin on my site http://www.pharmtechguide.com. The problem is that it shows one quiz on the main page, and it works, but then the second quiz on the main page won’t work. If you click on the link on the non-functioning one and show it on only one page, then it works. But, if you choose the category menu, then none of the quizzes on the category menu work unless you select the individual quiz and show it on only one page. When i try to “Create New Quiz” i got the next message: You do not have sufficient permissions to access this page. Very nice plugin! But I was looking for a plugin alike, more like a test not a quizz ?! Where can I ever find this? I´m used to insert the code directly into posts, really messy. Thanks for plugin, its great! Is there any thing you can do for Multiple answers option… ??? 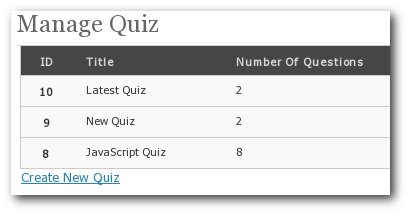 It is really a nice plugin for Quiz. I have used it and working fine. Is it possible to display on the blog post how many people have already take part in the quiz? If it is possible, how to display it? I love your Quizzin plugin, as I think I have expressed to you before. I have used it on my Website, but I edited your code to make a couple of minor improvements. However my site is predominantly owned by my partner and he has switched to WordPress MU, and with that you lose the ability to Edit the code of themes and plugins, which really pisses me off. Anyway there have been quite a few people who have used one of my suggested changes to your Quizzin plugin, but if they were to switch to WP MU they too would lose it because they can’t edit the code. There is a really simple solution, which would be for you to issue a new release of Quizzin incorporating my suggestions. Of course some people might like it exactly the way it is, so I am suggesting that you make my suggestions new Quizzin settings, or Quiz parameters. The other change relates to the ability to give a different response based on the score achieved, in each quiz. So when editing the quiz, instead of using your %%RATING%% variable with its values of ‘Failed'(0-39%), ‘Just Passed'(40%-50%), ‘Satisfactory’, ‘Competent’, ‘Good’, ‘Excellent’ and ‘Unbeatable'(100%), you could have a table of 10 ratings entries (with these values as defaults) that a quiz editor could change to suit their own purposes. Actually maybe 11 entries with one for > 100% for which the default response might be ‘Cheating’. This would also be extremely useful for people creating quizzes in a languages other than English. I hope you can see the value in my suggestions and can implement them for me and anybody else who loves your tool. Sorry my code segments are missing stuff, I just copied and pasted and the stuff got lost in translation, as did the indetation, but I think there’s enough there for you to get the picture. I also meant to Bold the . ‘. ‘ after $question_count in the two echo statements. because this is also additional to your original code. I hate to make an arbitrary choice – I don’t want to put in question count with giving the users an option to turn it off. I’ll see what I can do. Agreed! It should be a Quizzin setting “Display Question numbers?”. By the way one of the guys who used my suggested changes, and actually helped me fix the code (ferhat) because I had previously used $ques -> ID, which doesn’t work if you have multiple quizzes (because each question ID is unique across the whole installation not just this Quiz), has his quizzes in a foreign language, so I am sure he’d love the second suggestion regarding the table of user specified %%RATING%% values. Great Binny, I like your plugins. I am going to try out your plugin, but I would really like quiz results posted automatically in the comments, or mailed to me. Is this possible, or do you know if this is possible? Hey, would anybody know an easy way to insert my quizzes as sidebar widgets? I installed this plugin like admin. But other users of web (WordPress) with no admin role cannot create quizzes because they don’t see it in own Tools menu. How to do that? Can it be shown on sidebar? No – the current version can’t be shown in the sidebar. Hey Binny, is there a way to get the results emailed, like the survey plugin? Yes, its possible. Take a look at the Survey Settings page in admin. can results be emailed to admin ? Its possible. Take a look at the Survey Settings page in admin. looking for a simple one-question thing that changes regularly (quiz widget on sidebar). once you click on “Submit” or whatever – will pops a page, giving the right answer & explanation. Looking for the exact same thing, Ivana. Although this quiz plugin looks fantastic, I’m still searching for a “one question, pops up per day” plugin. Where can I edit so that the Submit button will direct to a specific URL instead? 1. I LOVE this plugin! I wanted to say that. 2. I do understand how to create the polls. Do I have to manually install the polls plugin? Or, can I use the quizzen? I cannot find the correct answer option. Which SPECIFIC option are you refering to? 3. Consequently, I cannot figure out how to make a survey. Do I have to manually install the plugin? Or, can I use the quizzen plugin? An interface? How do I create this? Or, should I just use the survey plugin. 4. Do the results get recorded? Hence, after 10 people use it, it says 6 people got this right and four people got it wrong. Can that happen? 5. Also, can I create a “personality quiz” Ie, I set up 10 questions with no “wrong” answer. After a person fills out the survery, it tell s them their personality. How ofted do you sleep? A. One to two hours B. Three Hours. C. 12 Hours. D. 19 hours. My blog is about the entertainment field. If this could be done, HOW can it be done? I’m sorry – but you are reading it wrong. I created 3 plugins using the code of this plugin. I created a Polls plugin and Surveys plugin. You have to use those plugin to get the functionality – you won’t be able to use this. About the fourth question, no, quizzin don’t record the results. About the fifth, you’ll have to edit the code to get that effect. I installed you plugin and go to New Quiz but when I enter the name and description and then save I get this error msg any ideas pls ? Please contact the server administrator, webmaster@commercialbrakecalipers.co.uk and inform them of the time the error occurred, and anything you might have done that may have caused the error. For the answers to each question– can substitute a picture instead text? For example: Which is the cutest pet? And there would be 3 pictures of a kitten, a puppy, a python with a radio button underneath each one. I have a little problem though. Whenever I try to save a new quiz, I am presented with the login screen. However, even if I log in with the right credentials, I cannot login, unless I reenter the correct website address in the adress line of the browser. The redirect_to is set to the http:// adress, not the https:// address. It is possible that your plugin cannot properly handle forced SSL login? Is it possible for you to fix that? Hi! This is an excellent plug-in. Like sakthi, I wish this would work with a multi-site installation. It’s just the plug-in I need to make an elearning site out of a WordPress site. Can someone please explain how I translate this? I have my nb_NO.mo and nb_NO.po files, they are now in the /lang dir. Should I name the languagefiles something else? Hello. thanks for the great plugin. Im searching for a plugin that can do just this!!! amazing!!! I use specialy wordpress theme, created just for quizzes and flash games. I can easilly add my flash based quiz or game to it. Also thanks for sharing this information about Quizzin. I never heard before about it, so now I will definitly try it. Thanks. Can the questions be shown in an unexpected order (randomly)? You’ll have to edit the code to do that. what is to change in the code? Which file and part of the code is to change? Provided of course that you don’t have, MU WordPress where they took away your right to modify plug-in code. As a consequence my question numbering that I worked so hard to put in, has now gone. So it would be nice if you gave us a parameter to turn Question numbering on if we wanted it Binny. Oh just saw another comment about MU and wanted to assure Sakthi that my Quizzes with Binny’s plug-in still work fine, it’s just that I can’t edit his code to put my Question numbering back in. Which file and part of the code is to change to show the questions randomly? You said that we can have the quizzes automatically sent to an email address under Survey Settings page admin… where is that located? Or do we have to install your survey plugn in be able to send emails from the Quizzin plugin? Thanks! Hello, I am interested in hiring you to modify this plugin slightly. It pretty much does everything I need it to do expect for a few minor things. If you are interested please do email me and I will reply. I am very serous and this is for a site i am currently making. I am having problem creating questions for this plugin. I wanted to have 10 questions in 1 page and managed to have only 1 question saved. When I typed the 2nd question, it could not be saved. I am using 2010 theme. Which version of WP are you using? I’ve set it to display questions one by one. With the first quiz I created, it does this just fine… but when I inserted a second quiz onto a different page, now all of a sudden both quizzes are displaying all the questions on a single page. Any idea why this is happening? Please let me know, as I love Quizzin and don’t want to switch to a different plugin. Thanks! There is a setting in Quizzin which you can use to say how many question you should show per page. Just make sure its set as 1. Its in Admin > Settings > Quizzin Settings. Thanks for replying. When I go to Quizzin Settings, there is a box that says “Show all questions in a single page” – and that box is already unchecked. I don’t see anywhere to define the # of questions per page. hi i have installed your quizzin plugin in my wordpress site now my client wants previous next in the front end question section i am not using show all questions in a single page and i use show answers at the end. this is awesome quiz plugin. I have installed Quizzin plugin. Its working fine. But i need display three questions. its display only one question that is my problem. Is there any possible to display three question. Setting > Quizzin Settings > Show all questions in a single page. Make sure that’s ticked. I am getting as given erro..
Pls any one help me. This usually means an instantiation error. Try copying all the files of the plugin again. In my web site; The answers seem to under the radio buttons. Radio buttons at the top, the answers remain at the bottom. I deleted tags from show_quiz.php but it didnt fix. Should be an issue with your theme’s CSS file. At least, thats what it looks like. Can you have any idea about that? I am having problem with the font size of quiz questions display. It used to be fine, but lately the font has gone smaller. Do you know where in the code I can increase font size? You’ve been much helpful to all those using this plugin. We appreciate your good work and am one of those using the plugin. I would to know if its possible to put a time code on the quiz so that the quiz in session will end automatically and view the results in case the time elapses. It’s not possible by default – you’ll have to do a bit of custom coding to get that result. Very fantastic plugin..Binny you are great.. I have been using your plugin for about 3 years now and it has continued to work very well with new versions of wordpress. I would love to give you a donation, but I cannot find any way to provide a donation to you. Also, I want to make sure that this plugin continues to work with future changes to WordPress. Do you plan on keeping it working with updates to WordPress. I surely would be willing to support this plugin on a regular basis if I knew that I would always work. Please let me know how I might be able to donate to you. Also, do you have any plans to improve the quizzin plugin such as storing user test scores or features like drag and drop matching? Thanks a lot 🙂 You can always donate to my paypal account – the email id is binnyva (at) hotmail. If you find any issue with it, just let me know and I’ll look into it. But, yes, time is a bit of a challange for me – I have other things to do too. I have some ideas for Quizzin – but the two you mentioned are not in it yet. I’ll see what I can do. Binny, great plugin. I have a problem now, however. As I said, the plugin works, just I cannot access the settings. That’s odd. Which version of Quizzin are you using? Make sure its the latest.